MANILA -- A Philippine court has declared Abu Sayyaf a terrorist organization in a ruling that provides the government with another legal weapon against bandits who have survived years of US-backed offensives, state prosecutors said Thursday. 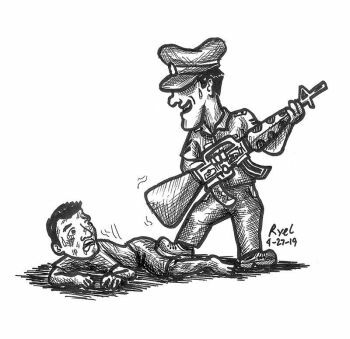 The Abu Sayyaf is the first bandit organization to be officially outlawed in the Southeast Asian country under a rarely used anti-terrorism law. The brutal group, which has targeted Americans and other foreigners, has already been listed as a terrorist group by Washington. 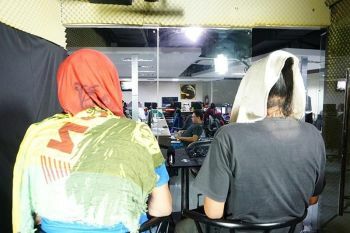 Philippine prosecutors said the terror designation will help the government hunt down and prosecute the Abu Sayyaf and get court permission to place suspected bandits under surveillance. Officials could impose sanctions against members and supporters and make it harder for the bandits to receive financial support because of their designation as outlaws, they said. "This is one more way to turn our country into a hostile ground for terrorists," state prosecutor Aristotle Reyes said. He said the court decision was crucial because a number of Abu Sayyaf commanders have expressed allegiance to the extremist Islamic State group, although there has been no evidence of any active collaboration or contacts. Army Brigadier General Allan Arrojado, a military commander leading sporadic offensives against the Abu Sayyaf in Sulu province, welcomed the court ruling and expressed hope that other legal steps would be taken to support counterterrorism forces, including the creation of special courts to speed up terror convictions. The Abu Sayyaf -- or Bearer of the Sword -- was founded in 1991 on southern Basilan Island. An unwieldy collection of Islamic preachers and outlaws, it vowed to wage jihad, or holy war, but lost its key leaders early in combat, sending it on a violent path of extremism and criminality. Today, it has degenerated into a few loose factions with about 400 ragtag fighters and no central leader. But the group remains resilient and violent, engaging in ransom kidnappings and extortion that have allowed it to survive without considerable backing from foreign extremist groups. Under the 2007 Human Security Act, the Department of Justice asked a court in Basilan province five years ago to ban the Abu Sayyaf. Government prosecutors presented four witnesses, including a former Abu Sayyaf commander who testified how the group planned and committed brutal attacks, including the 2001 kidnapping of 20 people, including three Americans, at the Dos Palmas resort in western Palawan province. One of the Americans was beheaded, another was killed during an Army rescue and the third was wounded but survived. Judge Danilo Bucoy praised the witnesses in his 20-page decision, a copy of which was obtained by The Associated Press. "These witnesses deserve praise and commendation for their courage and audacity to stand against this violent, treacherous and vicious organization," Bucoy said. State prosecutor Peter Medalle said the government could now take steps to outlaw at least three other Moro bandit groups. They include the Bangsamoro Islamic Freedom Fighters, a small group of bandits who oppose peace talks with the government and have attacked government troops and civilians, he said.